presents the work of a photographer, video and sound artist. Last year Khatun (Khatun is a commom surname mostly used in the Muslim community of the Murshidabad District where woman are commonly referred to as Khatun.) dropped out of school and now she starts her day by putting tobacco flakes inside tendu leaves which are cut into small rectangular pieces and rolls it down with a yarn tied over it, securing it tightly and tucks its one end with a small iron rod to make one beedi. She rolls 1000 sticks of beedi, rocking back and forth for 12–14 hours a day to earn a partial sum of less than 2 dollars. She often complains of having pain in her back due to sitting several hours at a stretch in the same position, but the pressure to keep up with the speed and meet the target is so intense that many of them have to skip their meals and even avoid drinking water, so they do not need to go to the toilet. It's a story of every young girl in Murshidabad district of West Bengal state in India. who are seen rolling beedi from dark dingy rooms to open spaces making it India's largest centre for beedi rollers. Mothers teach their daughters the art of rolling beedi from the age of 5 and before puberty, girls gain mastery over rolling beedi. Most of the beedi workers admit their children to school, but a majority of girls are pulled out of education by the time they complete primary school to support their family's income. Families encourage girls to roll beedi, this ensures them a good marriage and if not married then she still continues to be an earning member. Is this what is desired for children? Where are the rights of the child? Is economic value the only value of the girl? 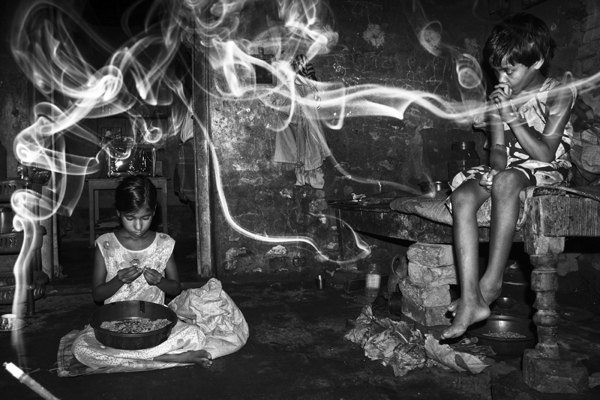 Around 1.7 million children are engaged in India’s beedi industry. Nowadays girls from an age as early as three have started taking beedi rolling as a game, cutting their notebook papers to make paper beedi. Girls are continuously exposed to tobacco due to which they suffer from Tuberculosis, asthma & burning of the eyes along with frequent chest pain, cough, headaches and respiratory problems. Beedi rolling has come to its peak point where it's taking a turn from a need to a culture which is performed in every house of Murshidabad, where beedi rollers have increased from being 0.4 million (2003) to 1.1 million in 2016. Out of which 90% of them are females working in their homes. Their stories are widely untold and often overlooked with ignorance. They are cheated out of play, education and health, effectively denied a childhood and it's a fate of every girl here. Masood Sarwer is a documentary photographer based in New Delhi. Born and brought up in West Bengal, India. In 2018, he won the scholarship to attend Foundry Workshop for his long term project and his work has been published in the Indian daily newspaper, The Hindu. Previously his work has been exhibited at Matheran Green festival (2016) and his photographs have been also published on online platforms like National Geographic Traveller magazine. He completed his Diploma in photography from the APEX Institute, New Delhi under the guidance of Sandeep Biswas, Dinesh Khanna & Aditya Arya. “Burning both Ends” deals with life of women and children Beedi rollers who come from very poor backgrounds. Murshidabad is a quite an underdeveloped town of the eastern state of West Bengal. While most men could be leaving their families behind, in search of manual labour jobs in larger cities and struggling to fight the exploitation in the urban world, their women folks would be exploited by the local bustling and exploitative tobacco industry of Beedi making . This industry might give them a very small daily survival, but in the long run, it is a slow death towards their physical and mental health. They have to work long hours, their children get swallowed into the trap, regardless of the harm and an uncertain future. 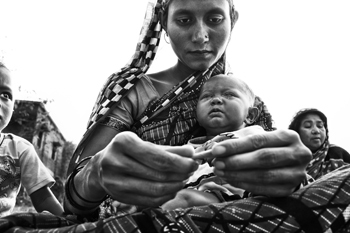 Masood who is a native and a young photographer from Murshidabad, has been exploring the world of this community and their struggles for survival as well as their search towards a hope of a more equal human world. His images in black and white are a testimony of these lives. These stark visuals are somewhat voyeuristic, yet it seems like Masood and the community have found a comfort within each others company to bring us this story together. film/video or sound artist for one month.